NASA began a new chapter of its Martian chronicle today (Aug. 22) when the agency named its Mars rover Curiosity's landing site after the late science fiction author Ray Bradbury. Curiosity's landing site inside Mars' vast Gale Crater was rechristened "Bradbury Landing" today to honor the iconic writer's legacy and dedication to Mars exploration, NASA officials said. Ray Bradbury died in June at age 91. His first book, "The Martian Chronicles," paints a vivid picture of the human exploration of Mars through a series of short stories. The book was published in 1950 and later adapted into a TV series and video game. The Mars rover Curiosity landed on Aug. 5 inside Gale Crater to determine if the area could have ever supported microbial life. 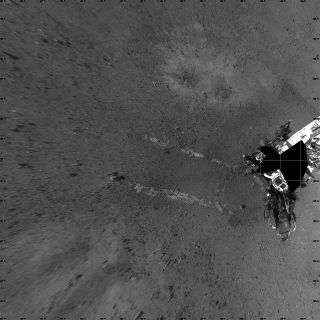 The site of Bradbury Landing is the space contained within the first boxy wheel marks made by Curiosity as it was lowered to the Martian surface by its sky crane descent stage, Meyer said. Curiosity took its first test drive on Mars today, rolling forward, then turning in place and photographing its tracks on the Red Planet. "I kind of like the name. For one, it was the majority vote by the science team, having been inspired by Ray Bradbury," Meyer added. The name also is a nod to the era of ocean exploration on Earth that took adventurers to many new lands, he added. NASA has a long tradition of naming landing sits on Mars after scientists and other icons related to space exploration or the Red Planet. "Since sending the first rover to Mars in 1997, NASA has made it a tradition to name its landing sites after visionaries and explorers who devoted their lives to expanding our boundaries," said Robert Pearlman, editor of the space history website collectSPACE.com and SPACE.com contributor. "Previous sites are now named in tribute to astronomer Carl Sagan and the fallen astronauts of space shuttles Challenger and Columbia," Pearlman added. "'Bradbury Landing,' named after the late author Ray Bradbury, is a fitting tribute to a man who, through his writings, inspired us to imagine life on Mars — both alien and human. Those themes parallel Curiosity's goals of seeking out signs of habitable environments for past and present Martian life and advancing the day when humans can follow the rover to the Red Planet." NASA named the Mars Pathfinder lander that touched down on Mars in 1997 with the Sojourner rover the "Carl Sagan Memorial Station." The 2004 landing sites of the Mars rovers Spirit and Opportunity are dubbed the "Columbia Memorial Station" and "Challenger Memorial Station," respectively. NASA's oldest Mars lander, Viking 1 — which launched 35 years ago this week — also received a new name during its mission. Viking 1 was renamed the "Thomas A. Mutch Memorial Station" in honor of Thomas Mutch, the leader of the Viking imaging team, after his death in 1980 — two years before the lander's mission ended. The Viking 2 lander, which launched shortly after Viking 1, was later rechristined the "Gerald Soffen Memorial Station" after Gerald Soffen, the chief scientist of the Viking missions. The $2.5 billion Curiosity rover mission is expected to last at least two years on Mars.